Work quietly and stay on task. Raise your hands for questions. Everyday when a class comes into my art room, they have three crayons on the board. The class can lose a crayon if it is being noisy, or students are off-task. 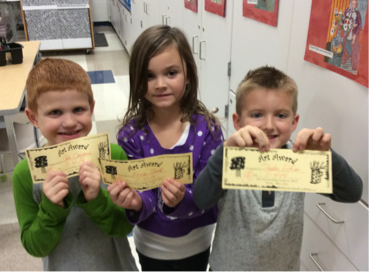 The class can earn crayons back if students are working hard and staying on task. At the end of the hour, the number of crayons left equals the number of art awards I give out. A student can get an art award for many reasons. Here are a few; doing personal best, being a good listener, staying on task, being helpful and kind to others, having a positive attitude and creating beautiful artwork. This is my way of making sure each student is recognized for working hard in my class! Each student will have a turn to get an art award before the end of the year. A student will receive three warnings before this note goes home. The first warning is a verbal warning. The second is a five minute time-out. The student stays in his or her seat, but is not allowed to chat with friends or work on artwork for five minutes. At the third warning, I change the students seat for the remainder of the art class. If the negative behavior still continues this note will be sent home. The student has to have the note signed and returned to me within a week. If I don't receive the note within a week, I will call home.